The major objective of this report is to analysis Performance evaluation through credit division of Mercantile Bank Limited. Other objectives of this reports are to achieve positive Economic Value Added (EVA) each year, how to be market leader in product innovation, how to be one of the top three Financial Institution in Bangladesh in terms of cost efficiency and how to be one of the top five Financial Institutions in Bangladesh in terms of market share in all significant market segments we serve. Finally this report make swot analysis Performance evaluation through credit division of Mercantile Bank Limited. Commercial banks, which are the traditional “Departmental stores of finance”, serve a wide variety of customers. Historically, the commercial banks were the major institutions that handled checking accounts and through which the Federal Reserve System expanded or contracted the money supply. Today, however, other institutions also provide checking services and significantly influence the effective money supply. Conversely, commercial banking organizations provide an ever-widening range of services, including trust operations, stock brokerage services and insurance. Banks are the most important financial institution in the economy. They are the principal sources of credit (loan able funds) for millions of individuals and families for many units of the government. Banks are also closely watched because of their power to create money in the form of easily spend able deposits by making loans and investment. Changing in the volume of money created by banks appears to be closely correlated with economic conditions, especially the growth of jobs and the presence of absence of inflation. The fact that banks creates money, which impacts the vitality of the economy. Bank provides individuals and business with loans that support consumption and investment spending. The primary job of a central bank is to carry out monetary policy, which involves making sure that the banking and financial system functions smoothly and that the supply of money and credit form that system contributes the nation’s economic goals. By controlling the growth of money and credit (including the loans made by banks), the govt. and central bank try to ensure that the economy grows at an adequate rate, unemployment is kept as low, inflation is held down and the value of the currency in the international market is protected. Channeling of fund from savers to spenders is so important to the economy because people who save are frequently not the same people who have profitable investment opportunities available to them. The absence of financial market individual lender and investor / borrower can not get together. Without a financial market it is hard transfer funds from savers to investor/borrower. Financial intermediaries’ i.e. Depository Institution like Commercial Banks, Savings and Loan Associations, and Credit Institution. It mainly consists of export, import and other foreign remittance. Direct Investment, export, import and foreign remittance etc play an important role in a developing economy. There is a great opportunity to invest the foreign remittance, which also comes from” wage earners” working abroad, in several prospective investing fields like energy sector, telecommunication, information technology etc in our economy. With the advent of the 21st century, globalization and consolidation amongst the multinational and foreign companies are making their impact in the third world economics including that of Bangladesh. To address this ever increasing competition, Bangladesh financial institutions and other companies and firms are gearing themselves in order to meet challenges both locally and as well as international market. Financial Institution perform the essential economic function of channeling funds from people who have saved surplus funds by spending less than their income to people who have a shortage of funds because they wish to spend more than their income. The channeling of fund from savers to spenders is so important to the economy because people who save are frequently not the same people who have profitable investment opportunities available to them. The absence of financial market individual lender and investor/borrower can not get together. Without a financial market it is hard transfer funds from savers to investors/borrower. Financial intermediaries’ i.e. Depository Institutions like Commercial Banks, Savings and Loan Associations and Credit Institution. Commercial Banks raise funds primarily by issuing checkable deposits (deposits on which checks can be written), saving deposits (deposits that are payable on demand but do not allow their owner to write check), and time deposits (deposits with fixed terms to maturity). They than use these funds to make commercial, consumers and mortgage loans and to buy Government securities and municipal bonds. The main objective of the study are to contribution to the economy through the extension of Loan and Advances of Mercantile Bank Limited and to have an overall idea on how it operates and what functions it does and how it plays vital role in the economy growth of GDP prepare a report on it. Besides these main objectives there are some specific objectives. To have an understanding of the overall functioning of a bank. To know the credit products offered by the Mercantile Bank Limited. To familiarize rules and regulation approval of loans and advance procedures. To familiarize the bank sources of the funds and how it is collected. To know about the implementation of the loan procedures and how the loan will be disbursed. To recognize and analysis the terms that’s related to the extension of the loan. To identify the sector where MBL provide the credit facility like: Trade and business, import, export, garments, fisheries, real estate and micro credit programs that’s the primary parameter of a country’s economic cycle. To explain the role of Financial Institution of Mercantile Bank Limited while financing scale enterprises through the formation of a consortium of banks. To analyze the financing systems of the Bank and find out whether the bank needs any improvement to be done and make greater contribution towards the country’s economy. After a deep worldwide recession, the global economy appears to be expanding again, pulled up by the strong performance of Asian economies and stabilization or modest recovery elsewhere, Global GDP which contracted by 0.8% is expected to expand by 3.9% in 2010 and 4.3% in 2011. Unprecedented public intervention, different amount of fiscal stimulus packages combined with accommodative monetary policy over the globe has stabilized activity and fostered a return to modest growth in several economies. According to International Monetary Fund (IMF), advanced economies are projected to expand by 2.1% and 2.4% in 2010 and 2011 respectively following a contraction of 3.2% in 2009. On the other hand, World Bank (WB) is projecting the same nearly to 1.8% and 2.3% respectively in 2010 and 2011. While Real GDP growth in emerging and developing countries are forecast to reach almost 6% and 6.3% in 2010 and 2011 respectively, up from2.1% in 2009. Emerging and developing economies are generally further ahead on the road to recovery, led by resurgence in Asia. The rebound is driven by China, India and the fastest growing economy of the world is expected to grow by 10% in 2010 up from 8.7% in 2009.While India, the other potential economic superpower of the world is expected to expand by 7.7% in 2010 from 5.6% in 2009. The Low levels of capacity utilization and well-anchored inflation expectation are likely to contain inflation pressures. In the advance economies, headline inflation is expected to pick up from zero in 2009 to 1.25% in 2010. In emerging and developing economies, headline inflation is expected to edge up to 6.25% in 2010, as some of these economies may face growing upward pressures due to more limited economic slack and increased capital flows. The world trade volume is also expected to expand by 5.8% in 2010 from contraction of 12.3% in 2009. Although, Economic growth was solidified and broadened in the second half of 2009, this growth prospect does not allow the world economy to be complacent, as there remains a concern that the recovery will stall. Premature exit from accommodative monetary and fiscal policy-induced rebound might be mistaken for the beginning of a strong recovery in private demand. In general, the fragile global economy still seems vulnerable to a range of shocks, including rising oil prices, a virulent of H1N1 flu, geopolitical events or resurgent protectionism. The economy of Bangladesh performed remarkably well despite the worst world economic crisis with 5.88% growth in Real GDP recorded at the end of FY09. Record remittance inflows combined with sluggish imports and moderate export growth caused the current account of the Balance of Payment (BOP) to record a surplus of almost 3% of GDP in FY 09, up from less than 1% of GDP in FY 08. With the capital and financial account of the Balance of Payments broadly in balance, the improvement in the current account caused to accumulation of foreign exchange reserves which hit USD 10.00 billion for the first time in November 2009. Inflationary pressure was low during the first few months of 2009 due to the depression in world market but it started to increase with the world economy getting back it’s natural pace. The Gross Domestic Product (GDP) growth during FY 09 was 5.88% with agriculture growing a robust 4.2%, industry at 5.8% and services at 6.1%. Though GDP growth decreased in FY 09 as compared to 6.19 growths in FY 08 but it was a quite satisfactory result for Bangladesh in consideration with the world wide economic meltdown and collapse of economic giant of the world during the period under review. Mercantile Bank Limited emerged as a new commercial bank to provide efficient banking services with a view to improving the socio-economic development of the country. The philosophy of Mercantile Bank Ltd is not to ‘carry coal to the new castle’. The main target is to make credits available to the poor people and their activities are aimed at comprehensive growth where people from all economic strata will enjoy the benefits of better living standard, dignity of labor and self worth. The Bank determined to build a long-term customer relationship with its corporate & general clients. As a part of this, Mercantile Bank ltd. is trying to expand their business with the market leaders of each sector of business. Mercantile Bank ltd. emphasizes not only on customer satisfaction but also emphasizes general banking and credit management system. So that customer can get better service from every side of overall banking. Mercantile Bank Ltd is always ready to maintain the highest quality services by upgrading Banking technology, well management system and applying high standard of business ethics through its established commitment and heritage and is representing itself with true concept as ‘Banglar Bank’. The bank mobilized total deposits of BDT 49,538.36 million as of December 31, 2008 as compared to that of BDT 39,348.00 million up to December 2007. Competitive interest rte rates, attractive deposit products, deposit mobilization efforts of the bank and confidence reposed by the customers on the bank contributed to the notable growth in deposit. The bank introduces a number of attractive deposit schemes to cater the requirement of small and medium savers. This improved not only the quantum of deposits, but also brought about qualitative changes in the deposits structure. The bank has formulated a policy to give more priority to Small and Medium Enterprise (SME) while financing large-scale enterprises through consortium of banks. Total loans and advances of the bank stood at BDT 41,993.95 million as of December 31, 2008 as compared to BDT 31,877.86 million at the end of December. Mercantile Bank Limited has offer a broad array of innovative financial services specially designed to match the specific requirement of the client ranging from large corporate houses, small and medium enterprises to private individuals. The team of professionals assists the clients in finding the most appropriate financing package making use of the Bank’s own resources and/or organizing loan to help the clients realize their short-term goals and long-term aspirations. Foreign Exchange department facilitate the inflow and outflow of foreign currency exchange by opening export-import L/C. This department also facilitates local L/C. Issue of D.D, T.T & M.T. To make customers life more convenient and comfortable, Mercantile bank offer variety of lending option for their customer. On-line service is now available for all customers of the bank. On-line banking have so far activated with 42 branches. As a result, it saves the time and efforts of the customers. They can easily deposit and withdraw money, transfer money from one place to another place by using online banking facility. Minimum deposit limit: TK 500000 per transaction cumulative deposit shall not be more than TK. 1000000 per day. Maximum Withdrawal limit: TK 500000 per transaction cumulative withdrawal shall not be more than TK. 600000 per day. The bank serves the customers by providing ATM Booth and SME Service Centre facilities. A number of ATM Booths and SME Service centers have been unlocked at different commercially significant places of the country to serve the customers, to save their time, consequently, to make them free from hassle. International/Dual card is accepted all over the world at millions of outlets and ATMs. A Dual card is also accepted in most of the big cities like Dhaka, Chittagong, Khulna, Rajshahi, Sylhet at more than 10,000 outlets including 4500 POS. It covers various kinds of merchants like hospital, hotel, restaurant, department store and the card has accessibility to any outlet having VISA logo. Advance against Credit card: MBL cardholder can take advance as term loan up to 50% of the card limit to be repaid on the monthly installment basis.Any POS transaction over TK. 20000 but not exceeding 50% of the credit limit is convertible to Personal loan/CCS and to be repaid on monthly installment basis. Repayment period of such loan may be from 6 months to 36 months. Payment of utility bills like telephone bills, gas bills, electric bills, water bills, may be settled by card. Under this scheme, one can deposit a certain amount of money for a period of six year. After six years, the deposit amount will be doubled. Deposit becomes double in six years. Tenure of the deposit is 06(Six) years. The ‘Quarterly Benefit Deposit Scheme’ will be maintained for a period of 3 (three) years and the minimum amount of deposit is BDT 50,000.00 (fifty thousand) or its multiples. Interest will be paid on quarterly basis as per example given below. On maturity the principal amount will be paid back. The prime objective of this scheme is to encourage the people to develop their habit of saving. Under this scheme, one can save a fixed amount of return every month and get a lucrative amount of return after five, eight or ten years. Saving for rainy days. Monthly installments of various sizes. Help the retired persons for investing their retirement benefits. Create investment opportunities for Non-Resident Bangladeshi. Give investment opportunities for Trust; Foundation etc. Deposit a fixed amount of money for 05 (Five) years. Depositor will get a certain sum of money in each month proportion to his/her deposit during the entire tenure. Tenure of deposit is 05 (Five) years. Under this Scheme, one can deposit a certain amount of money for two years. The depositor will receive the benefit on yearly basis. The benefit amount of first year will be received in advance at the time of deposit. On maturity, the depositor will get back the principal amount with the benefit amount of second year. Get Extra benefit from minimum Deposit. Maintained for a period of 2(Two) years. Minimum deposit amount 1,00,000(One Lac) only. Consumers’ Credit Scheme is one of the popular areas of collateral-free finance of the Bank. People with limited income can avail of credit facility to buy household goods including computer and other consumer durables. Help fixed-income people for buying house hold durable. For the amount up to Tk. 1,00,000 the period is two years. The loan amount is directly credited to the customer’s account. This scheme has been designed especially for the businessmen who need credit facility for their business and can’t provide tangible securities. Extend credit facility to small shopkeepers. Give collateral-free credit Maximum amount of loan Tk. 2,00,000. Repayment period 3 years & Interest rate will be charged at quarterly rest. This scheme has been designed to assist and encourage the genuine and capable entrepreneurs and professionals for acquiring capital machineries, medical equipments, computers, vehicle and other items. Flexibility and easier terms and conditions of this scheme have attracted the potential entrepreneurs to acquire equipments of production and services and repay gradually from earnings on the basis of ‘Pay as you earn’. Service Charge 0.25% per year on outstanding balances. Primary: Ownership of fixed items. Collateral: Landed property, Bank Guarantee, ICB Unit Certificate etc. Help new F.C.P.S. or post-graduate doctors for setting up chambers and buying medical equipment. Help experienced doctors for refurbishing chambers and buying medical equipment. Assist private clinics for acquiring modern medical equipment. » Experienced doctor 15.00 Lac. » Hospital, Clinic and Diagnostic Center 50.00 Lac. Service Charge / Ledger Fee 0.25% per year on outstanding balances. Rural Development Scheme targeted for the rural people of the country to make them self-employed through financing various income-generating projects. This scheme is operated on group basis. Raise the standard of living of rural people. Initiative to break the vicious cycle of poverty. » Maximum Tk. 5,000 per person. » Gradually enhance able up to Tk. 10,000. Personal Loan Scheme has been introduced to extend credit facilities to cater the needs of low and middle-income group for any purpose. Government and semi-government officials, employees of autonomous bodies, banks and other financial organizations, multinational companies, reputed private organizations and teachers of recognized public and private schools, colleges and universities are eligible for this loan. Car Loan Scheme has been introduced to enable middle-income people to purchase Cars/SUVs/Jeeps. Government and semi-government officials, employees of autonomous bodies, banks and other financial organizations, multinational companies, reputed private organizations, teachers of recognized public and private universities and businessmen are eligible for this loan. Interest rate will be charged quarterly rest. Maximum loan amount is BDT 25.00 laces. BDT 7.50 Lac for reconditioned Car/Jeeps/SUVs and BDT 25.00 Lac for new Cars/Jeeps/SUVs. Women Entrepreneurs Development Scheme has been introduced to encourage women in doing business. Under this scheme, the Bank finances the small and cottage industry projects sponsored by women. Small and Medium Enterprise (SME) Loan Scheme has been introduced to provide financial assistance to new or experienced entrepreneurs to invest in small and medium scale industries with a comparatively low rate of interest as the same is assisted by the Bangladesh Bank with refinancing facilities. To meet the growing need of housing for middle and lower-middle income people, MBL has introduced Home Loan Scheme. We also support the Bangladesh Bank’s Home Loan Refinance Scheme. The Scheme boosts up the growth of housing sector. Such loan shall be available for purchase or construction of new apartments for self-residing purpose. Overseas Employment Loan Scheme is designed to facilitate the Bangladeshi youths seeking employment aboard but who are unable to meet the expenses to reach the workplace from their own sources. The ultimate objectives of the scheme are to promote skilled / semi-skilled manpower to different countries across the world as well as to provide support to Government Policy considering priority of this sector. By availing loan under this scheme, the active youths of middle and lower middle class can get overseas employment by avoiding borrowing from the illustrious class or village ‘MOHAJON’ at a very high cost or selling their paternal properties. The scheme helps fetching foreign currency for the country as well as fulfills the Bank’s commitment to encourage micro-lending for poverty alleviation, improve the quality of life and thereby contribute to socio-economic development of the country. All the banks provide SME financing facilities do not provide long term loan to its customers. Among the banks Prime bank and Dhaka bank both provide term loan and working capital loan to their customer. Other banks either provide term loan or working capital loan to its customers. The bank has opened three service centre located in the key areas, which may work as unique selling points to pursue customers. MBL has a vast line of services, which can attract people of different segment of the society. Mercantile Bank Limited (MBL) currently don’t have any strong Marketing Activities through mass media e.g. Television. They even don’t have any sales people who can sell their product. Competitor gave more benefit and attractive packages in providing services. The focal opportunity of Mercantile Bank Limited (MBL) should be its competitors’ vulnerabilities. To propagate the line of customers the bank will have to introduce tempting features embedded with the product. Major contract with big corporate houses as well as middle class people might be a good market to exploit. The main threat for Mercantile Bank Limited (MBL) is a wide range of competitors. About ten of them are multinational. The multinational banks came to our country with vast resources, like financial and marketing skill. Also new invented business tools and techniques are channeled to them from their parent organization. So, it is a threat for the MBL. Mercantile Bank Ltd actively participate in the growth and expansion of the national economy by providing Loan to viable borrowers. While analyzing the SME Loan policies and procedures of the Bank, the following areas were mostly viewable. Lack of sufficient Executives or Officers especially in the Credit Division hampers the Loan Sanctioning Process in time. MBL takes relatively more times in granting loans advances to different parties. It seriously discourages the persons who are inclined to get loan for their urgent purpose. Mode of disbursement, charge documents etc. creates bottleneck in Loan approval process. Head Office takes so longer time in processing and approval of decision in every expect of work . Sometimes the total Sanctioning Process event takes month after month to give the final decision. MBL does not sanction loan to all sectors equally as they require, rather it concentrates its loan and advances within some limited fields and category. In Service MBL doesn’t comply with the requirements of its policy and Bangladesh bank guidelines exactly. There is discrimination in sanctioning sector wise breakup of loans and advances. Small and Medium enterprise (SME) are more popular and require things among the people of various classes but MBL don’t have any customized schemes targeting various classes of people. Even the effective rate of interest is very high. And the terms and conditions of are also very inconvenient and discourage people. Lack of information on application requirement among the seekers. Absence of an appropriate and clear cut legal framework 4 enforcing quick recovery. MBL should disburse their loans in various sector rather than specific scheme. SME Loan sanctioning and disbursement procedure should be easy and flexible being considered the requirements of different classes of people. Amount of loan can be raised in proportion with the existing demand of people in loan, SME loan can be popular among the small trader and lower income group people like MBL DPS. MBL credit Policies can be revised being considered with the increase demand of telecom, transportation, Knit and packaging and plastic industry. Bottlenecks or barriers should be removed by taking advanced steps in mode of disbursement, charge documents and approval process. Loan facility parameter should be expanded so that all the people can get loan according to their needs. Business Power for sanctioning loans and advances can be increased at branch level. In rural areas, Mercantile Bank should provide the SME Loan to alginate the poverty and also increase the self relevance. It will act as a promotion policy. The Bank should have more conference in overseas, work shop, symposium, and seminar for more expansion of loan. More service center need to be added to fully take the advantage of the huge potential customer segments. The sectors where the bank is investing should need much concern and need a revision so that investments are not resulting in desired outcome. 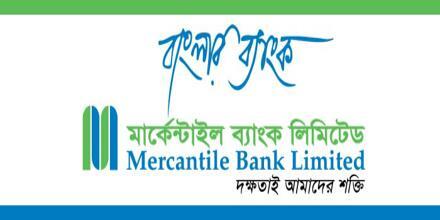 Mercantile Bank Limited is a strong and effective player in the financial system. It is a solid, forward-looking, modern local bank with a record of sound performance. It is a new generation bank. It is committed to provide high quality financial services /products to contribute to the growth of GDP of the industrialization, boosting up export, creating employment opportunity for the educated youth, rising standard of living of limited income group and overall sustainable socio-economic development of the country. The bank has the vision to be the best Private Commercial Bank in Bangladesh in terms of efficiency, capital adequacy, asset quality, sound management etc. it is now one of the top most profitable private sector commercial banks. As concluding remark the bank is able to attain a leading role with the 10 years success story but to remain unrivalled among new generation banks, the bank must face new challenges. The bank must make a positive attempt to be more outward looking in their goals and aware of what is happening. They must also emphasize on the domestic scenario more closely and analyze any certain trends and strategies of their competitors. The bank must accept any failures and think of them as an objective to pursue future goals instead of blaming such failures on other factors and in this way the Bank will be able to keep on playing its important roles in our economy.